Tony La Russa was impressed by the efforts of Mike Matheny's club in 2015. The St. Louis Cardinals won 100 games in 2015, but fell to the Chicago Cubs in a four-game NLDS. Winning a hundred games in any season is a feat that deserves accolades, but considering the road blocks the Cards faced this season they might deserve an even bigger recognition. That’s at least what longtime MLB manager and current Chief Baseball Officer of the Arizona Diamondbacks Tony La Russa has to say about the recently-completed campaign. 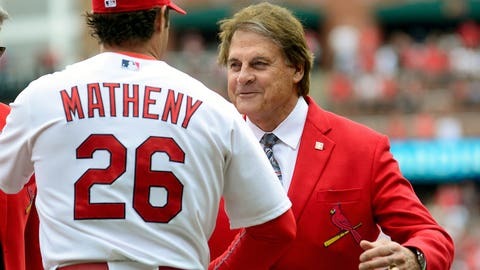 Derrick Goold of the St. Louis Post-Dispatch reported over the weekend that La Russa reached out to him after the club’s Game 4 defeat to share some insight about this year’s team. As was well documented, the Cards had to deal with a number of significant injuries to players including Adam Wainwright, Matt Holliday and Yadier Molina, to name a few. "From my time watching them (since the 1980s), being with them, and now being a has-been ex-Cardinal competing with them I can’t think of a better regular season in Cardinals’ history. It’s at least tied for first," La Russa told Goold. To outside observers, winning 100 games and failing to advance past the Division Series could be seen as a ‘disappointment’ – but to La Russa, that isn’t the case with Mike Matheny’s 2015 club. Based on their talented core, pitching staff and impressive young players, St. Louis should be capable of coming back strong in 2016 with another strong season..they just have one big decision to make before then.